Curated by Carly: Vote For Us! 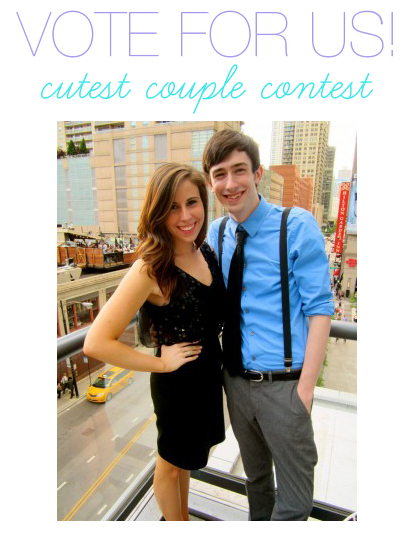 Devin and I have entered a Cutest Couple Contest through our apartment building and we need your votes to win! The winner gets free rent in March and our rent is a staggering $1,300. It would be a huge help as Devin is starting to pay off his student loans and I am only able to work part-time since I'm still a full-time student. If you could take a few seconds to vote for us, I would be beyond appreciative. It would mean the world to us if we won and had a stress-free month for once. Voting ends February 10! good luck!! you guys are the cutest! Voted - you are too cute!